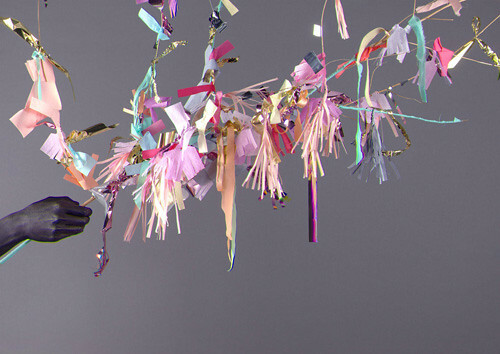 There is so much joy bursting from the online portfolio of Confetti System, owned by artists Julie Ho and Nicholas Andersen, that I have to show these beautiful handmade works to inspire you today. What a fantastic color explosion! You may recall seeing their window installations in J.Crew stores nationwide around the holidays... or around the web last year when I first found out about them. In case you have no clue what I'm talking about, then feast your eyes my friends on these shiny, happy things. I love these gorgeous, festive installations and imagine being able to decorate a huge room with them for a party as traditional party supplies can be quite tacky and dated, don't you think? I mean, how many more themed party supplies can stores manage to pump out? 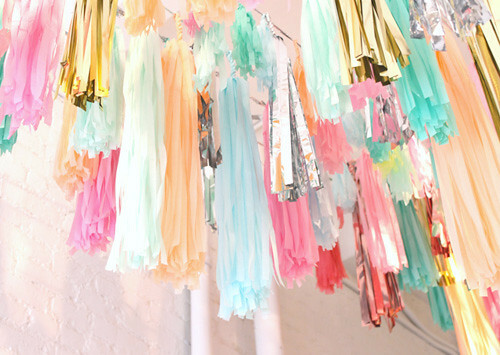 Furthermore, why is it so hard to find stylish streamers and other gorgeous things to pin, hang and toss around in the first place? 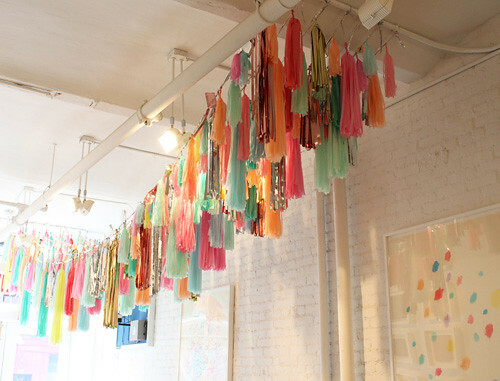 Confetti System doesn't mass produce their wares, it's true, so they may not be an answer to our party decorating prayers yet -- but perhaps someday we will walk into a shop and find party supplies that look like this. If that ever happens, I just may faint. I've been on a big "silver leather" obsession for a year now, I was sourcing it in Morocco last year and am always on the prowl for it as it's lots of fun to use in my own craft projects. 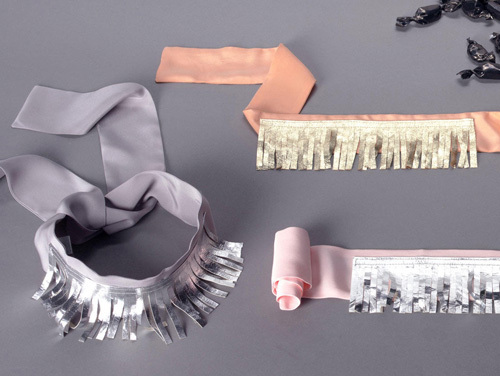 I loved seeing Confetti System incorporating leather into their blindfolds. There is some light at the end of the tunnel though in case you WANT to purchase what you see above. You can! 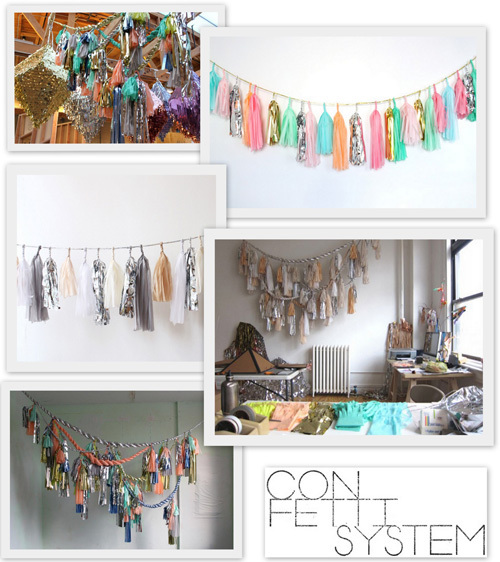 Confetti System has an online shop and they can also make decorations to order if you contact them directly. 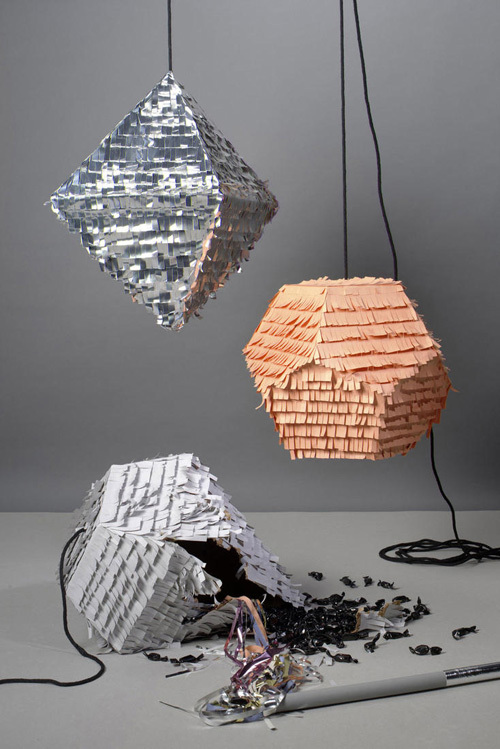 You can also find a limited collection of pinatas and blindfolds created for Bergdorf Goodman -- but only for the winter season -- so quick, hurry to BG at 745 5th Avenue in NYC if you want to grab a few for your next shindig. If you want to learn more about Confetti System you can read an interview and see photos of their work studio over at Sight Unseen and The Selby where Todd took some amazing shots.